Humans in Outer Space — Interdisciplinary Odysseys offers a collection of essays on the implications of human space exploration, written by a selection of space experts and scholars in the humanities and social sciences. This volume is the product of an interdisciplinary meeting, of the same title, organised by the European Science Foundation in Vienna, October 2007. A great range of different viewpoints are expressed here, and this book will almost certainly open your eyes to new perspectives that you hadn’t previously considered, whether you agree with them or not. The book is organised into three ‘odysseys’, dealing with, in turn, the presence of humans in Earth orbit, the effects that space exploration has on humans, and the likely consequences of human exploration and colonisation beyond the Earth. 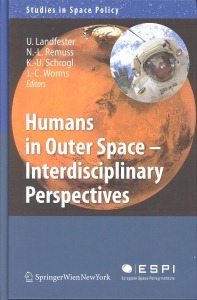 Various chapters deal with the societal or cultural implications of space travel; the legal framework of space exploration, including the international agreement for Planetary Protection; benefits and spin-offs from the space programme; and the likely reaction should we discover life beyond Earth. The final few chapters will be of greatest interest to astrobiologists. Gerda Horneck provides a summary of stellar habitable zones and a comparison of the Earth and Mars in terms of environmental conditions and habitability. Horneck also discusses the technological challenges involved in robotically searching for life on Mars, as well as the health hazards of the Martian surface environment to human explorers. Paolo Musso considers the likely philosophical and religious ramifications, focussing on Christianity, of the discovery of extraterrestrial life. Together, the contributions collated in this volume set out the ‘Vienna Vision’ on humans in outer space, and provide discussion on the likely impact of the discovery of life beyond the Earth.